The Avon Indiana real estate market actually improved year over year for the month of December. More homes sold, although only by a few, the price increase is very positive, especially for homeowners who are tracking the market and want to sell their home this Spring. I was interested to see how the numbers would pan out after November’s deluge of first time home buyers closed. Remember, the original deadline was November 30th for first time homebuyers who wanted to take advantage of the $8000.00 incentive, so many were already scheduled and closed in November. Will this become the normal? It is really anyone’s guess, but the year over year report for all home sales in Avon looks like the trend is starting to balance and move upward. Most of the 2009 home prices were below the average for 2008. The average price of homes in Avon has increased over the last few months. 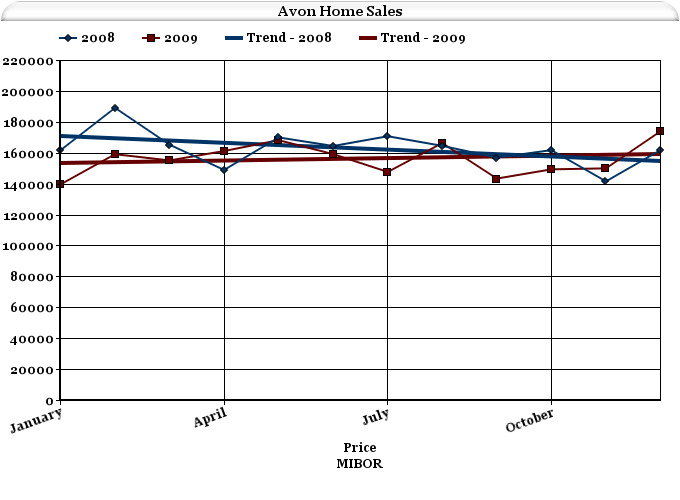 It's interesting to note there were only 7 homes sold in Avon in 2009 over $400,000. This is also a trend in housing; not only in Avon, but around Indianapolis and the country. As we look at the trending line in each of the graphs, we see the gap is starting to open up towards the end of the year. 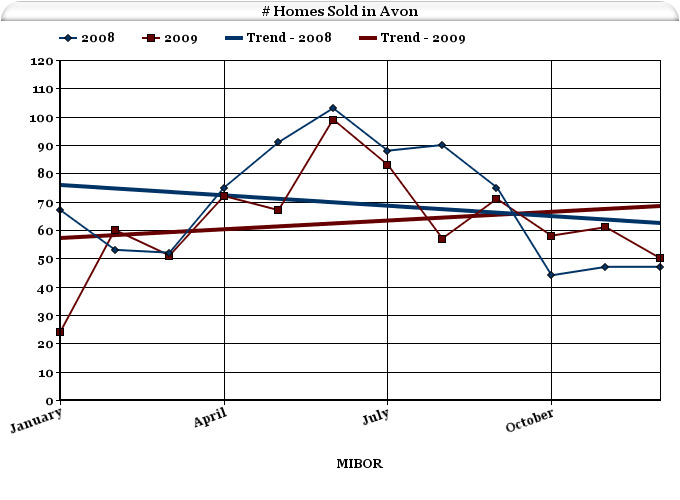 As we move into the new year, it will be interesting to see how homes sales in Avon compare to 2009. In 2008 there were 832 homes sold in Avon with 168 sold as distressed property, which is 20.2%. We currently have 403 homes for sale in Avon and 63 distressed properties.15.6% is a much lower number to start the year with. With 403 active Avon homes on the market, the current absorption rate is 8 months, which indicates it is still a buyer’s market. We’ll see that number reduce as we approach Spring. Average days on market and absorption rate will vary by price range. As always, if you have any questions about the values of homes in your Avon Subdivision or neighborhood or just want to talk real estate, you can email me or call me. Statistics were obtained from the Metropolitan Indianapolis Board of Realtors (MIBOR) data and are representative of Indianapolis homes which were listed on the Indianapolis BLC; private sales are not included. All information is believed to be accurate, but is not guaranteed. Indianapolis Real Estate Blog, written by Paula Henry, an Indianapolis Realtor and team leader of The Henry Group, at Keller Williams Realty, serving the Indianapolis and Avon Indiana real estate markets.